Draped in orange safety fence lining and gardening shovels, tall wooden boards bear text and photographs documenting the history of the Santa Cruz Beach Flats Community Garden. Images of children enjoying fresh produce and recorded interviews of the gardeners’ personal stories transport the garden into the gallery. 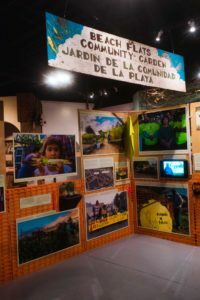 The “Mirando Al Futuro: The Beach Flats Community Garden” exhibit opened on Nov. 2, 2018 at the Santa Cruz Museum of Art and History (MAH). It recognizes the Beach Flat Garden’s contribution to Santa Cruz and showcases the voice of the city’s Latinx community. The exhibit will remain on display until Sept. 2. Beach Flats Garden volunteers, the MAH and ecologists collaborated to organize the Beach Flats exhibit. A display of pictures, depicting the history of the Beach Flats Community Garden. Photo by Nikolasi Saafi. In 2015, the garden was at risk of losing its land. The Santa Cruz Seaside Company — owner of the Santa Cruz Beach Boardwalk — announced that it intended to end its lease with the city and reclaim the Beach Flats property. Worried the history of the Beach Flats Garden would be lost, community members and volunteers initiated an effort to record stories and testimonials about the garden’s impact. Despite its small space, the exhibit communicates the garden’s history and personal stories of the gardeners. Hung high on the wall is a bright neon shirt with “¡Guarde el Jardin!” — or “Save the Garden” — that both gardeners and supporters wore in the 2015 protest to save the garden. Next to it are photos of a young girl eating a fresh ear of corn grown from the garden. Egerer and Glowa conducted seven oral histories with gardeners and collected photographs, articles and other materials that helped start a conversation with the MAH about potentially holding an archive. In a featured video, a gardener talked about the similarities between raising children and plants. He explained that neither can grow if not cared for properly. MAH’s exhibit highlights the role the garden has played in the lives of many generations of immigrant families. “Museums create this wonderful, visual, very engaging space for people to become connected, and that was a new way of thinking for me,” said Michelle Glowa, a doctoral candidate at UCSC. The exhibit highlights the garden as a place where people feel safe and connect with each other and their families. It acknowledges Latin American traditions, the essence of family and passing on generational knowledge. The Beach Flats Community Garden has been a staple of the Santa Cruz community for years. Thanks to volunteer efforts and the support of other local institutions, the garden will continue to thrive. Organizers of the exhibit hope it inspires more people to visit Beach Flats and utilize the resources it has to offer.